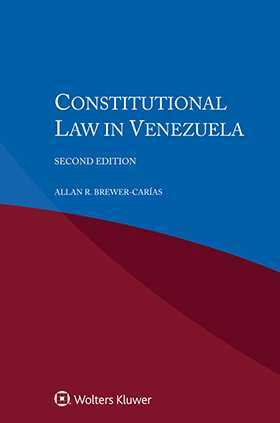 Derived from the renowned multi-volume International Encyclopaedia of Laws, this very useful analysis of constitutional law in Venezuela provides essential information on the country’s sources of constitutional law, its form of government, and its administrative structure. Lawyers who handle transnational matters will appreciate the clarifications of particular terminology and its application. Throughout the book, the treatment emphasizes the specific points at which constitutional law affects the interpretation of legal rules and procedure. Thorough coverage by a local expert fully describes the political system, the historical background, the role of treaties, legislation, jurisprudence, and administrative regulations. The discussion of the form and structure of government outlines its legal status, the jurisdiction and workings of the central state organs, the subdivisions of the state, its decentralized authorities, and concepts of citizenship. Special issues include the legal position of aliens, foreign relations, taxing and spending powers, emergency laws, the power of the military, and the constitutional relationship between church and state. Details are presented in such a way that readers who are unfamiliar with specific terms and concepts in varying contexts will fully grasp their meaning and significance. Its succinct yet scholarly nature, as well as the practical quality of the information it provides, make this book a valuable time-saving tool for both practising and academic jurists. Lawyers representing parties with interests in Venezuela will welcome this guide, and academics and researchers will appreciate its value in the study of comparative constitutional law. Chapter 1. An Outline of Venezuelan Constitutional History. Chapter 2. Some Basic Aspect of the Political System of Government According to the 1999 Constitution and Its Distortions. Chapter 3. Global Values in the Constitution. Chapter 5. Population (Demographic Data). Chapter 6. Constitutional Relationship between Church and State. Chapter 7. Constitutional Principles Regarding International Relations. Part I. Sources of Constitutional Law. Chapter 5. The Unwritten Law. Chapter 6. The Executive Regulations and Administrative Acts. Chapter 7. Codification, Interpretation and Publication. Part II. Basic Elements of the Representative and Participatory Democratic Political System. Chapter 3. Direct Democracy Institutions and the Referenda Voting System. Chapter 4. The Plural Political Parties Regime. Chapter 5. Institutions for Governmental Accountability. Part III. The Federation and the Territorial Distribution of State Powers. Chapter 1. The Centralization Process of the Federation. Chapter 2. The Contradictory ‘Decentralized Federation’ in the 1999 Constitution. Chapter 3. The Organization of Public Power in the Territory. Chapter 4. The Financing System of the Federation. Part IV. The Constitutional System of Separation of Powers. Chapter 1. The Principle of Separation of Powers. Chapter 2. Concentration of Powers and Authoritarianism in Defraudation of the Constitution. Chapter 3. The Rupture of the Rule of Law, the Rejected 2007 Constitutional Reform and Its Illegitimate Implementation. Chapter 1. The National Executive. Chapter 2. Constitutional Powers of the National Executive. Chapter 4. The Military and the National Security System. Chapter 1. The National Assembly. Chapter 3. Political and Administrative Legislative Control Procedures. Chapter 1. General Constitutional Regime Referred to the Judiciary. Chapter 2. The Supreme Tribunal of Justice. Chapter 3. The Dependence of the Judiciary and Factual Absence of Judicial Autonomy and Independence. Part VIII. Other Branches of Government. Chapter 1. The Citizen Power. Chapter 2. The Electoral Power. Part IX. The Constitutional System of Human Rights and Guarantees. Chapter 1. General Principles Regarding Human Rights and Constitutional Guaranties. Chapter 2. The Status of Persons and Citizens. Chapter 4. Social and Cultural Rights. Part X. The Constitutional Regime of the Economy. Chapter 1. Principles of the Economic System. Chapter 4. Monetary System and the Macro-Economic Policies. Chapter 5. Constitutional Provisions on Public Domain. Chapter 6. The Progressive Nationalization and State Ownership of the Economy. Chapter 7. The Implementation of the Rejected 2007 Constitutional Reform through Legislation in Order to Establish a Communal Economic System.